Leaves behind an incredible layer of protection and shine! 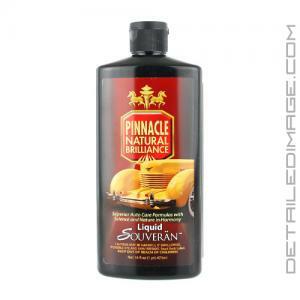 Pinnacle Liquid Souveran Car Wax is an easy to apply liquid wax that leaves behind an amazing shine! The secret to this shine is the high grade carnauba wax that were fused with Pinnacle's signature crystalline polymers. This combo allows for the maximum amount of carnauba wax to be packed directly into this easy to apply liquid formula. Simply apply by hand with an applicator pad, or via a buffer and a blue pad. You will be amazed at the glossy, reflective finish left behind. The crystalline polymers will allow water to bead off the surface while providing a durable 4 month barrier against road salt, bugs, tar, bird droppings, UV rays, and any other everyday contamination that your paint comes in contact with. Liquid Souveran even works to repel sleet and snow, leaving your vehicle cleaner during the winter months! Grab Pinnacle Liquid Souveran Car Wax today and leave behind not only an amazing shine, but a durable layer of protection as well! A non-abrasive Carnauba wax formulated for ease of application and maximum durability on all types of colors of paint. Shake prior to using. Work on one section at a time. On older cars with dull paint, polish with Pinnacle Paintwork Cleansing Lotion prior to waxing. By Hand or Machine: Work in a shaded area. Apply a small amount of wax to a dry foam or terry applicator pad (bonnet). Apply in small circular motions. Add wax as needed to help keep applicator moist. Allow haze to dry. Buff off with a clean towel. This is the only wax I'll use. Ease of application and removal are awesome.